Both newspapers, though, agree that he died at home after an illness of two years. Olivier was survived by his wife Elizabeth and their children, Mary, George, William, Cecilia (Celia), Julie (my grandmother), Joseph, Corinne (Cora), David, and Agnes (Aggie). 1. “Mariages et décès 1926-1997”, database, Généalogie Québec.com (https://www.genealogiequebec.com : accessed 3 September 2009), death entry for Olivier Vanasse, 7 December 1944. 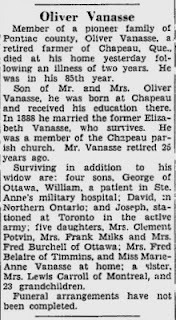 Also, “Olivier Vanasse”, obituary, The (Ottawa, Ontario, Canada) Evening Citizen, 8 December 1944, p. 14, col. 3; digital images, Google News (http://news.google.com/newspapers : accessed 18 February 2014), News Archive Search. 2. 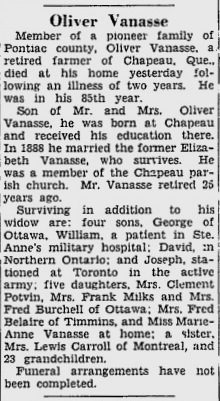 “Ontario, Canada, The Ottawa Journal (Birth, Marriage and Death Notices), 1885-1980”, digital images, Ancestry.ca (http://www.ancestry.ca : accessed 2 July 2013), Olivier Vanasse obituary; citing The Ottawa Journal, 9 December 1944, p. 17, col. 4; City of Ottawa Archive, Ottawa, Ontario, Canada; database created from microfilm copies of the newspaper.